It was refreshing to meet again with some of our missionary teams. From November 7-10 we held a training program for a select number of our church planters and missionary wives. In all, there were twenty-five participants. 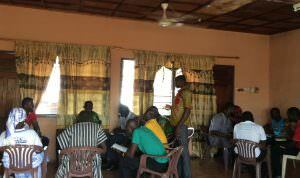 Most of the participants travelled long distances to attend the program. They were happy to learn how to do a Discovery Bible Study (DBS) to enable them grow their churches qualitatively and numerically. They were also taught some Community Health Education (CHE) topics like running micro-enterprises to generate income, how to respond to different worldviews, manage change and deal with the difficulties particular to their terrain, among other things. Serving with one’s local team on the mission field is a blessing, but meeting with other teams and listening to their stories is undoubtedly encouraging as well, especially in those moments that you realize you are not alone. There were also stories presented that challenged everyone to keep engaging people with conversations centered on the Bible. In addition to the Yipala group, this missionary couple has also begun the Kwawurakura group. They plan on giving the two groups informal vocational training, e.g. bead and soap making. There are about twenty-five women total. There is no doubt that these groups will continue to increase in number. Above all, they have the potential to turn into churches that reach out to their own communities with the Gospel. If these women could, on their own, invite their husbands to these meetings despite the negative way women are perceived and treated in such places, then suffice it to say that these women surely have a good thing going. It is possible for them to be the modern day example of the Samaritan woman through whom Jesus could bring an entire village to Himself. Please pray for these missionaries, as well as the two groups that meet every week.